He is the key to all our questions. I look out to the desert, and thought I saw nothing in hope. But then, only three things will remain, faith, hope and love, and the greatest of these is love. When I have nothing, all I need is God. I can only be still and know that You are God. I can only sit back and focus on who God really is. He is God, and God... is really God. 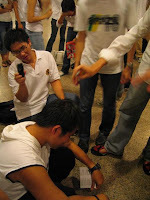 Given Singapore's political environment, it is taken that PAP is currently attempting to maintain its own political hegemony while students all over the place, especially in NUS and NTU and whatever place, or even other people (God knows who they are) are arguing for a viable opposition in the government for check and balance. The common excuses are that single party rule is not good in the long term, that other countries strive as well with opposition, that whatever whatever whatever, no transparency, blah blah blah, that the PAP might become corrupted, blah blah blah, that the PAP is losing its hold, etc etc etc, whatever. This is what I call the skepticism of the ruling party. And I dun see any basis for such arguments. Again I must emphasize that I'm not against these people and these views, but these views can better stand if provided with more evidences. Yesterday, Pastor Jeff preached a sermon about fatal attraction and the warnings of temptation getting a hold on us. It seems like temptations nowadays has become a major theme in my Christian life. Certainly God is trying to tell me something. Perhaps I have been too tired and worn out these days, that God is trying to warn me of temptations coming on me as I get very 'sianz' about what I have been doing. These temptations may have manifested into wrong thinkings and such, and it is important that I keep a lookout at how temptation is affecting my own spiritual walk right now. In reality, I just need to flee, but because we know that temptation is often there in our lives, I know I just have to keep a vigilant watch out. Yesterday NUS Fish Fillet had its first caregroup meeting. We first had our PnW session in one of the classrooms in E1, which was generally not normal, cos most cg meetings would start off with a dinner before proceeding to somewhere for PnW. But anyway, there's a reason for a scramble of order. It was a refreshing time of PnW, although it was still very tiring for the guitarist (who was me) to play through the whole PnW, but then, it was my second and I was glad to take up that challenge. After that we went off to Vivocity to have our dinner. And we really had a great time there. Although not everyone was there, but I really feel that the cg is taking shape. You know what is postmodernism? I finished lunch in the afternoon, and after a cigar, I began thinking about dung beetles and pi sai (鼻屎) and plates and bowling balls. I think about them for one afternoon. Then I write a book about what I have thought in the afternoon. Then the book becomes best seller and NUS use it as the textbook for a particular philo or lit module. Students all over the world will start writing essays trying to understand what I'm writing about, and they will raise ideas and put down ideas, and try to critic my book. In the end, the book is only about dung beetles and pi sai and plates and bowling balls, that's all. Today is the 1st day of my new cg, also known as NUS Fish Fillet (I gave the name myself one). This cg, will forever be known as the Fish Fillet cg to me. It's quite surprising that this cg can just gel together so naturally, maybe it's cos not everyone is around today. But certainly it's going to a fun cg. Therefore, I welcome myself to the new NUS Fish Fillet, and say sayonara to NUS Sushi. We had a farewell for cg last night at Yizhong's place, for people like me, Ziwei, and Yuantao who will be moving to another cg, led by Michelle. This post shall contain my extended last words (words which I haven't been able to speak out last night). Indeed, NUSA3... this is the cg which I have grown up in since the day I received Christ. The day I came in, it was only QP, Christine, Edwin, Jessie, Robert, Rueyfeng and me. Later, Yishyan came to know Christ, followed by Ziwei who came in from the youth. After that, this cg grew, and I mean it really grew. We saw Shuyi, Lishan and Ashleigh joining us, after Robert and Rueyfeng moved on (although Lishan and Ashleigh later left the cg to add strength to to the others), we saw Yuantao, Ceyang (sensitive though but I still wanna remember that moment), and followed by Yizhong coming to join the cg. As I spent the past 1 year in this cg, I have grown to fall in love with this cg. It becomes sort of a spiritual home for me.